Set the scene around 1984 at a busy bowling alley. Uninterested in the ball and pin action, a young girl begs a fist full of quarters from her father and walks with purpose past the rumble and crash of the lanes. Upon reaching the snack bar, she commandeers a bar stool and maneuvers it through a pair of glass doors into the darkness beyond. Shoving it up to a brightly painted game cabinet and seating herself, feet dangling, the girl feeds the machine some change and dedicates the next hour to knocking enemy knights mounted upon vultures from the sky and fleeing in panic from a pterodactyl. As a little kid, I cut my gaming teeth in the arcades. I may have only played two games, Donkey Kong Jr. and Joust, but I would seek them out any time I could. Computers were still exotic things with green screens, found at the back of the school library and at my parents' office. My first interactions with them were via MS-DOS games bearing simple names like Castle Adventure and Bouncing Babies. The Atari 2600 first released the same year I was born and became my first console some time in the 80s. I probably owned around a dozen games for it before my dad broached the subject of upgrading to a new game machine and I made the fateful choice between a Sega or a Nintendo. Mario won the day. All the same, it would not be until I owned a Super Nintendo and the 16-bit wars with the Genesis erupted before I would identify as a gamer, complete with console loyalty. In those days, Sonic was the mascot of evil, even if he did have a damn good Saturday morning cartoon. The N64 came next, and also ended my stint as a Nintendo console fangirl. There was no use denying the siren call of the PlayStation thanks to the likes of Mega Man and Final Fantasy. 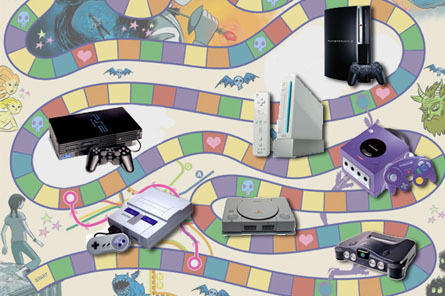 The GameCube followed, then the PlayStation 2 which in turn bring us to present day with the Wii and PlayStation 3. Of course, in companion to these consoles I owned every iteration of the Game Boy, then the DS Lite, and now the 3DS. In other words, I've been gaming a long time. I still own a fair number of games spanning multiple console generations. Every few years, I like to revisit the collection and clean house. Tastes change as we age and what was once loved can fail to hold up after a few years have passed. It is time to replay everything. And you, you lucky people, get to watch me go all nostalgic. To the game cave! Something I drew long ago. Color Pencil. I kicked things off with a few play throughs of the original Star Fox followed by Star Fox 64. The original game holds up beautifully in spite, or perhaps, because of its primitive visual style. The graphics consist of very simple flat shaded polygons which give the game a surreal appearance that really looks no worse now than it did then. The action remains fast and furious and the ship maneuvers pretty darn well for predating Nintendo's analog stick. Star Fox 64 is actually a remake of the first game, telling the same story but providing different locations, and in terms of sheer imagination, I feel the original was more creative. SF64's planets and patches of space are a bit mundane compared to the original's hollow volcanic world, nebula filled with space born life, and claustrophobic corridors inside giant battle cruisers. The first game even played a little bit with weather and changing environments. What SF64 brings to the table are a couple new vehicles and varying scenarios like guarding a base, dodging search lights and good old fashioned dog fights. I also much prefer the original's music over SF64's soundtrack which is unmemorable. I think I might recall reading somewhere that the quality of the music took a hit to accommodate the voice work done in SF64. I suppose it balances out, after all, those talking animals launched a thousand memes and provided some questionable innuendo, so it's all good? But what happened to this promising series? 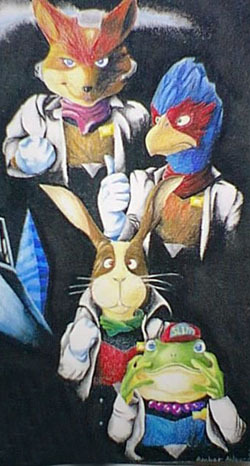 The next game to come out was Star Fox Adventure, a game by Rare that originally had nothing to do with Star Fox. It combined three things I love: animal characters, action-adventure, and dinosaurs. It should have been a winner but ended up the pinnacle of mediocrity. If I ever get my hands on this game again, I absolutely will write a detailed critical analysis for it to try and figure out what the heck went wrong. This game was then followed by Star Fox Assault and then Star Fox Command, all games I no longer own. They just weren't very good and added piles of melodramatic nonsense to the story. As a fan of the first two games, I hope the series sees another reboot and revival. With Star Fox 64 3DS, at least I know Nintendo hasn't completely forgotten about the franchise. Maybe there's yet hope. Mega Man 2 was my first Mega Man game, and like so many long running series I first encountered on the NES, it wasn't until the SNES that it clicked with me. In this case, it was actually Mega Man X I fell in love with—but I'm getting ahead of myself. During the mid-to-late 1990's I was a huge Mega Man fan. I even joined a Mega Man fan club on AOL (you remember AOL, right?). Due to reasons I really can't fathom, shortly after joining the club the person running it quit and gave the club to me (if I remember correctly, it was called the Mighty Mega Man Club). I think I'd only been to two chat room meetings by that point. Well, I took the "job" seriously and expanded the club, then merged with another club and ran an interactive fan fiction role play thing (the WAS: War Against Sigma) for around two years with our members. Good times. In fact, it was the news that Mega Man 8 was hitting the PlayStation and not a Nintendo system that convinced me to expand beyond the N64. I bought the game when it released (and a few others) but didn't get a PS until a year and a half after it had launched. I even put down the hundred buck collateral needed to rent a PlayStation from Blockbuster so I could play MM8 soon after I'd bought it. The rental system didn't come with a memory card so I actually left it running for two days solid so I could finish the game. This leads to a sad truth. On this, my latest revisit of these two venerable titles, I find myself no longer really enjoying them. I guess my tolerance for auto-scroll-you-into-a-bottomless-pit stages has hit an all time low. Both MM7 and 8 have too many annoying elements for my older self to overlook. With a bit of sadness, I place them on the cull pile. 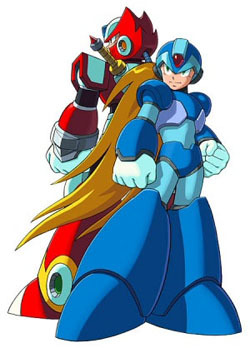 As I had mentioned, Mega Man didn't click with me upon my first exposure, and thus I ignored the series for a long time. It wasn't until Nintendo Power magazine made a big deal over Mega Man coming to the SNES that I started paying attention again. Considering all the coverage Nintendo Power was giving it, I decided to rent the game and see what all the hoopla was. By the time I returned it I'd fallen in love and bought the game a few days later. If I didn't like MM7 and 8 any more, how would I feel about X? It was with a bit of trepidation that I began replaying this once favorite series. My fears were unfounded. X is still awesome, and so are X2 and X3. The stages in these games are varied and well designed. The bosses are cool, the secrets are fun to find and make you feel like a badass. Mega Man X4 also passes muster, but it's a weaker game and frankly, I keep it to play as Zero. I used to own X5 and 6 as well, but by that point the games were badly repeating themselves and the plot had become contaminated with overwrought convoluted spew that made no frigging sense. Out of curiosity I Youtubed Mega Man X7 and 8. Oh the horror. Next episode- the mascot invasion.